Although the rootkit was just a proof of concept (which is usually enough for a white-hat researcher), it does demonstrate that you can (with proper skills, tools and lots of patience) reverse-engineer IOS, write your own code and insert it into IOS image. The rootkit presentation prompted Cisco to generate an excellent document describing how to detect patched IOS images and the precautions you can take to ensure an intruder does not get access to your devices. On the other hand, I was bitterly disappointed by the lack of coverage from the "industry press". There was speculation that Cisco released three patches in anticipation of the presentation (anyone who looked into what those patches were would easily find out that two of them were not IOS related) and a few notable exceptions correctly describing the situation, but some publications that were very loud before the presentation forgot to tell their readers that the threat was "slightly" over-rated. Of course, the lack of interest in non-sensational news has already started conspiracy theories. If you want to have more details, read a down-to-earth description of the presented rootkit by Nicolas Fischbach. Our developers have just released the BGP Policy Routing E-Lesson that accompanies the Scalable Policy Routing IP Corner article. The lesson contains an instructor-led presentation that explains the concepts and a remote lab where you configure and test the solution without endangering the operations of your live network. If you'd like to review the e-lesson and write/blog about it and the concept of short e-learning modules covering very specific technologies or design scenarios, send me a message describing what you'd like to do and I'll organize the access to the e-lesson for you. Sebastian Majewski has found an interesting feature: if you use the network route-map BGP configuration command to originate BGP prefixes and use the match conditions within the route-map, BGP inserts the IP prefix in the BGP table only if the source route in the IP routing table satisfies the route-map conditions. More details and a sample router configuration are available in CT3 wiki. Based on the somewhat surprising results of the routing protocols poll (the high percentage BGP got), it would be nice to know the network type that you design/manage/operate. Please respond to this week's readers' poll; if you work for Cisco, other equipment vendors or a system integrator/professional services company, simply select the network type that you work with most often. The results of the routing protocol poll are in. 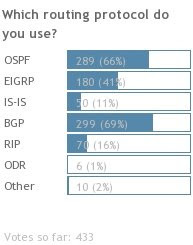 As expected, OSPF is more popular than EIGRP (60:40 ratio), with IS-IS having significant presence (primarily large SP networks, I would assume) and some people using RIP in the edges of the network. What really surprised me was the very large percentage of users using BGP. Either BGP is becoming very popular in the enterprise networks or most of the readers are coming from Service Provider environments. And last but not least, it looks like I'm focusing on the topics (BGP and OSPF) that you actually use in your networks (or maybe it's a self-fulfilling prophecy and you read my blog because I write about topics that you're interested in :). The best one I've found so far is the Inside Cisco IOS Software Architecture , but it's a bit old, so if you've found something better, please comment. Full disclosure: if you click on the link above and buy the book, I might eventually get $1.76 from Amazon. The NTP Implementation Quick Learning Module we've developed teaches you how to use Network Time Protocol (NTP) on Cisco IOS devices to synchronize with a reliable time source. The presentation part of this e-lesson describes NTP basics and IOS implementation details. The hands-on remote exercise enables you to configure multi-tier NTP implementation on Cisco routers. The router and the cable modem are power-cycled. The router starts to bridge between all LAN interfaces, effectively connecting inside workstations directly to the cable modem. One of the workstations could detect a LAN failure (due to router reload) and restart the DHCP process (a Windows XP host would definitely do that). The DHCP requests from the workstation are bridged straight to the cable modem which caches the workstation's MAC address and forwards the DHCP request. The workstation is assigned a public IP address (at this time, the workstation is connected directly to Internet and thus vulnerable). The router loads Cisco IOS and reinitializes the Ethernet interfaces. Bridging between internal and external interfaces is stopped. The router sends DHCP request on the outside interface, but the modem ignores it, as the MAC address of the DHCP request differs from the previously cached one. In most cases, the cable modem has to be power-cycled to lose the cached MAC address. This behavior can be observed only if the router and the cable modem are reset at the same time and the cable provider doesn't care much about MAC security and allows the modem to learn the MAC address. If you reset only the cable modem, the router is not bridging (no problem); if you reset just the router, the cable modem still caches the router's MAC address and ignores the DHCP request from the inside workstation(s). Would it be possible to explain in detail a scenario where dual-as and as-overide is being used and another scenario where dual-as (using no-prepend / replace-as), as-overide and remove-private-as are used? I decided to start from the last item. The neighbor remove-private-as option is used in scenarios where you run BGP between public and private AS numbers to collect IP prefixes and advertise these prefixes to the rest of the world as belonging to the public AS. The most common design in this category is multihoming to a single ISP. A few weeks ago I've described how to use the append show filter and more command to send e-mails containing multiple printouts from an EEM applet. A few hours after I've published the post, David Houser sent me a great EEM applet that used texts stored in flash: files to generate headings between various show commands. While his solution works perfectly (and gives you all the flexibility you want), it's a bit verbose and requires lots of small files that clutter your flash: memory. I've thus decided to write a small Tcl script that executes the Cisco IOS command specified in the command line and appends the command results together with a heading in an output file. In the last days, industry journalists have started to make a big fuzz about a Cisco IOS rootkit that someone is going to present in a few days. Personally I doubt it would go beyond Tcl scripts that we already know about (OK, maybe it's EEM-based so it doesn't need a VTY and maybe it starts at router reload) … but I might be really surprised. However, the Cisco's response to this announcement (which was basically saying "we haven't seen anything new yet") included a nice gem: a link to the Cisco Guide to Harden Cisco IOS Devices document. I'm positive the IP prefixes reserved for private use by RFC 1918 are well-known to anyone building private IP networks. Likewise, you should be familiar with reserved AS numbers documented in RFC 1930 if you're building private networks running BGP. But if you know there are reserved DNS domains that can be used to write sample configurations and test code, you're smarter than I was a few weeks ago. I was writing the June IP Corner article and needed to set up DNS servers within the lab. I used example.com as the domain name and decided to check what would happen if you'd visit the actual www.example.com web site (try it out). It politely referenced me to RFC 2606, which documents the reserved domain names you can use. As a rule, you should use private IP addresses, AS numbers and domain names in all technical documentation you're producing (unless, of course, you're describing an actual network). If you're forced to use public addresses or AS numbers (for example, to illustrate how the neighbor remote-private-as command works), you should clearly state that the AS numbers are imaginary. Use the latest 12.4T software (at least 12.4(15)T5) if you want reliable CPPr operation. control-plane aggregate service-policy disables any control-plane subinterface service policies. If you want to use the per-subinterface (host, transit and cef-exception) policies, you have to remove the inbound service policy from the control-plane aggregate path. Routed packets that cannot be CEF-switched (have to be punted to another switching mechanism) are classified as transit packets. Local multicast packets with destination IP addresses within IP prefix 224.0.0.0/24 and packets with TTL <= 1 are classified as transit packets in 12.4(15)T5. These packets will be classified as cef-exception packets in the future (see the Understanding CPPr document). Unicast packets without IP options addressed to the router and having TTL > 1 are classified as host packets. Non-IP traffic (ARP, Frame Relay keepalives, CDP ...) is classified as cef-exception. The TTL-related rules explain why the router classifies IBGP packets as host packets and EBGP packets as transit packets. As soon as you configure neighbor ebgp-multihop on the router router, inbound EBGP packets become host packets. Years ago EIGRP and OSPF had strong presence in large enterprise networks, BGP was used solely by Internet Service providers and IS-IS was a rarity (and there were people using Banyan Vines). The situation has probably changed over the last years, I would (sadly) expect EIGRP to decline and (happily) BGP to grow. Let's figure it out; please respond to this week's readers' poll. Of course you can choose more than one routing protocol. Sebastian Majewski has contributed a short article to the CT3 Wiki explaining a hidden Cisco IOS router configuration command that can bypass the limitations of the IBGP multipath load sharing in scenarios where the paths across which you want to load-share cross different upstream autonomous systems. Euphrates Greene sent me a report of a very annoying “functionality” of Cisco 851/871: they're bridging between the inside (LAN) ethernet and outside (WAN) ethernet interfaces while they're running the ROMMON code (from the reload/power-up throughout the software decompression process until the control is transferred to the Cisco IOS). It's worth mentioning that these routers are commonly used as SOHO firewalls and that the internal LAN is exposed while the router is in the bridging mode. Our security experts have replicated the behavior and reported it to Cisco PSIRT. Fortunately it's a known vulnerability, documented as CSCsd60259 (release note is available on CCO to registered users) and fixed with a ROMMON upgrade. New routers are shipped with new ROMMON version, so you shouldn't be seeing this behavior on brand new boxes … but one cannot help but wonder why such a nasty behavior was not documented as a field notice/security advisory. One of the comments to my Sunday post mentioned RTBH. Obviously I'm not geeky enough, as I had to ask uncle Google for help (but don't worry, I'll work on my geekiness factor :). The search results produced a few very interesting links, among them a well-structured presentation on RTBH that refers to a paper describing how you can detect remote DoS attacks with the backscatter analysis (assuming the attackers are randomly spoofing source IP addresses). If “policy routing” reminds you of nightmarish spaghetti solutions of hop-by-hop route-maps, read my Scalable Policy Routing article. It describes how you can use a distance vector routing protocol (BGP is used in the article, but you could do the same with EIGRP or even RIP) to solve common policy routing problems in a highly scalable way. I'm reading your book MPLS and VPN Architectures and I've found the ip vrf forwarding name fallback global command in the “Additional Lookup in the Global Routing Table” section. I can only find this command in Junos, but not in IOS. … and he was right. When we were writing the book, we described several features that were still in development as it looked like they would be in the production code by the time the book was published. Many of them made it into the public IOS releases (for example, the Carrier's Carrier architecture), but some of them (like this command) simply vanished from the surface. However, it looks like the engineers that switched from Cisco to Juniper took the concept with them and implemented it in JunOS, so JunOS has this feature but IOS doesn't.